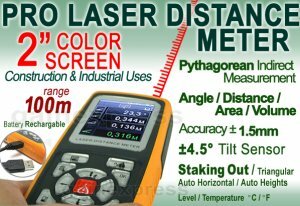 This Professional Distance Meter that uses laser & tilt sensor technologies comes with powerful interactive function& professional measuring and other auxiliary functions with unique private setting-up make your measure more enjoyable. Even in case of absence of reflecting board, this unit is capable of taking measurement up to 100m (328ft) easily due to its high precision (as high as ±1.5mm accuracy)and interference-free technology. It use of Pythagorean Theorem to measure distances or lengths indirectly when direct measurement is not feasible. Li-ion battery can set you free from replacing battery frequently. One person distance, area and volume measurement precisely in an instant and estimating tool to measure remote and difficult reaching places. 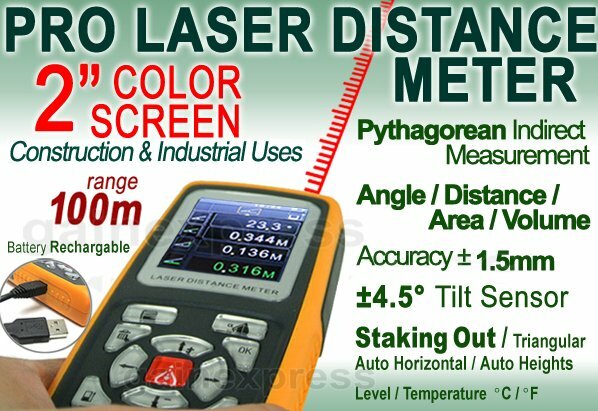 A very useful tool for various types of applications in construction and industries and a very convenient to that gives accurate measurement of distance, area and volume especially in large areas such as rooms, apartments, buildings, real estates, factories, warehouses, gardens, roads, infrastructures, and many other applications requiring accurate results for distance , area and volume measurement.